Every day, millions of employees in Europe are exposed to noise at work. In case exposure to noise occurs over several years/decades at levels, for example a road builder is exposed to, this may cause hearing impairment, if protection is not provided or is not used. Noise exposure to a single event may result in instantaneous hearing impairment, if the single event shows a very high peak level, which may be generated for example by handguns or explosions. In case of occupational hearing impairment the sensitivity of hearing, the dynamic range of hearing, the localisation of sound sources and the selective spatial listening may be impaired. This means, that persons concerned are no longer able to follow conversations, while background noise is present, as found for example in pubs, when listening to friends. This may lead to social isolation. Again millions of European workers are exposed to mechanical vibration transmitted to their hands from powered tools or transmitted to their whole body from the seats of industrial vehicles. Workers exposed regularly to excessive hand-arm-transmitted vibration may be suffer in the long term with disturbances to finger blood flow and to the neurological and locomotor functions of the hand and arm. This has an impact on social and family life. Periodic attacks of impaired blood circulation will take place not only at work, but also during activities such as car washing or watching outdoor sports. Everyday tasks, for example managing small buttons on clothes may become difficult. Vascular disorders, neurological disorders and bone and joints abnormalities caused by hand-transmitted-arm vibration are recognized occupational diseases in several European countries. The transmission of vibration to the body is dependent on body posture. The effects of vibration are therefore complex. Studies of long-term exposure to whole-body vibration have shown evidence for an elevated risk to health, mainly in the lumbar spine but also in the neck and shoulder. In some countries and under certain conditions, lumbar disorders occurring in workers exposed to whole-body vibration are considered to be an occupational disease. The communication from the European Commission concerning its action programme relating to the implementation of the Community Charter of the Fundamental Social Rights of Workers provides for the introduction of minimum health and safety requirements regarding the exposure of workers to the risks caused by physical agents. As a first step, the European Parliament and the Council adopted on 25 June 2002 Directive 2002/44/EC on the minimum health and safety requirements regarding the exposure of workers to the risks arising from physical agents (vibration). As a second step, it is considered appropriate to introduce measures protecting workers from the risks arising from noise owing to its effects on the health and safety of workers, in particular damage to hearing. Therefore the European Parliament and the Council adopted on 6 February 2003 Directive 2003/10/EC on the minimum health and safety requirements regarding the exposure of workers to the risks arising from physical agents (noise). The first European Noise Directive on the protection of workers was published on 12 May 1986 [86/188/EEC] in the Official Journal of the European Communities. Member States brought into force the laws, regulations and administrative provisions necessary to comply with this directive. Those regulations and administrative provisions have been established and are well known today in European companies. The old Noise Directive [86/188/EEC] did not provide any exposure limit value. Table 1 shows a comparison of exposure action values and exposure limit values of the old and the new Noise Directive. The lower and upper action values were lowered by 5 dB(A) by the new Noise Directive [2003/10/EC]. The European Vibration Directive on the protection of workers was published on 25 June 2002 [2002/44/EC] in the Official Journal of the European Communities. Member States had to bring into force the laws, regulations and administrative provisions necessary to comply with the Directive before 6 July 2005. Several possible exemptions were specified, for example for work equipment, which was given to workers before 6 July 2007, or for equipment to be used in agriculture and forestry sectors or for sea and air transport. For details the national transposition of the European Directive should by consulted. The Vibration Directive [2002/44/EC] provides exposure action values and exposure limit values. Table 2 shows those values. "The employer shall find out the level of exposure his employee is exposed to at the specific conditions the employee uses the tool/equipment"
The measurement of mechanical vibration is much more laborious than the measurement of noise. Therefore the Vibration Directive does allow for use of observation of specific working practices and reference to relevant information on the probable magnitude of the vibration corresponding to the equipment or the types of equipment used in particular conditions of use, including such information provided by the manufacturer of the equipment. The employer shall find out the level of exposure his employee is exposed to at the specific conditions the employee uses the tool/equipment. The information on vibration exposure provided by manufacturers of tools and equipment are obtained under specified standardised conditions. That enables the employer to find out, when purchasing new tools or equipment, which tools or equipment will have lowest emission of mechanical vibration to operators. But for the assessment of the employee’s actual mechanical vibration exposure reliable estimates have to be used considering all conditions of the workplace in question varying from the standardised conditions. Thus for hand-arm vibration a guideline (CEN/TR 15350:2006 Mechanical vibration. Guideline for the assessment of exposure to hand-transmitted vibration using available information including that provided by manufacturers of machinery) has been developed by CEN and published by national standardisation organisations. Relevant data and advice for employers on mechanical vibration exposure that might be useful are published by various well known institutions; as examples http://www.hse.gov.uk/vibration/ for UK and www.bg-vibrationen.de for Germany are mentioned here. For the calculation of the A(8), considering all tools and equipment relevant for the assessment of exposure to mechanical vibration used by an employee, HSE provides a Hand-Arm Vibration Exposure Calculator at: http://www.hse.gov.uk/vibration/hav/vibrationcalc.htm (and BGIA at http://www.dguv.de/bgia/de/pra/softwa/kennwertrechner/index.jsp in German) as well as a Whole Body Vibration Exposure Calculator at http://www.hse.gov.uk/vibration/wbv/wholebodycalc.htm (and LAS http://bb.osha.de/docs/GKV_calculator.xls in German). 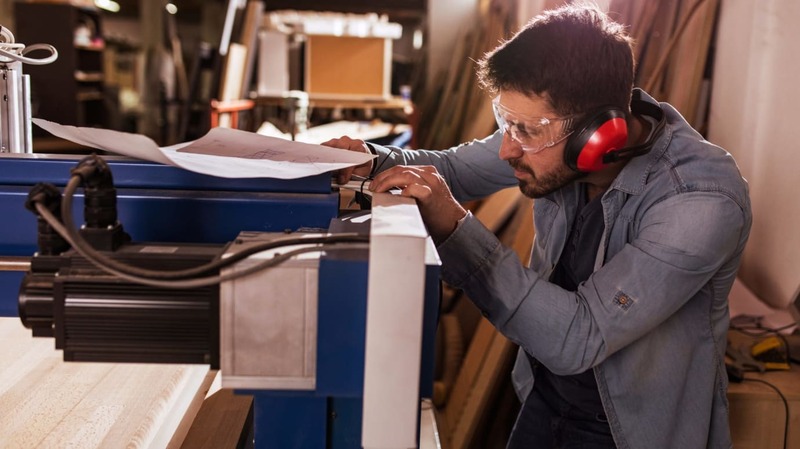 Information provided by the manufacturers of tools or equipment can generally only be used for the assessment of noise exposure within the purchasing process by comparison of quotations. During the design phase of plants experts may use computer based programmes together with the sound power levels of tools and equipment to predict the noise exposure levels at future workplaces. Because the use of information provided on noise by the manufacturers of tools and equipment is very limited the availability of relevant reliable noise exposure data or the measurement of noise is important when assessing noise exposure. It is necessary to implement a noise monitoring programme, if factors exists which suggest that noise exposures in the workplace may be at daily noise exposure levels of or above 80 dB(A) or the maximum value of the ‘C’-frequency weighted instantaneous sound pressure level exceeds 135 dB. Guidelines on how to observe such factors are often available via institutions responsible; for example the German institution for statutory accidents insurance and prevention for construction industry (BG BAU) provides tabulations on activities, tools or equipment, for which noise exposure levels may exceed the action levels. In case use of portable tools may result in exceeding the upper action values those tools are frequently marked by tools’ manufacturers. In addition the user information on noise emission, which is required by the Machinery Directive to be provided by the machine’s manufacturer, may give rise for implementation of a noise monitoring programme. Noise exposure can be determined in various ways. When assessing the noise exposure as required by the European Noise Directive it is important to safeguard the protection of workers exposed. That means it is up to the employer either to determine the actual personal exposure of each individual (“personal noise monitoring”) or to implement an “area monitoring”. For the assessment of the personal risk, as necessary for example for providing hearing checks or hearing protectors, the area monitoring is only acceptable in case the personal actual exposure determined can be reliably expected to be lower or equal to the result, which would be obtained by personal noise monitoring. In case employees are not mobile, area monitoring is much easier to handle and much cheaper than personal noise monitoring. If only a few employees move about in different noisy areas, determination of exposure duration may be enough to calculate the personal daily noise exposure level. Exposure calculators are available for example at: http://www.hse.gov.uk/noise/calculator.htm. In case the personal daily noise exposure level is expected to be close to the action levels, it may be useful to spend time and money to obtain an accurate result. That may demonstrate, that the action level is not exceeded, which may save time and money for those measures, which have to be taken otherwise. i) The choice of the measurement strategy depends on the complexity of the work situation and the purpose of measurements. ii) The proper positioning of the microphone is important, because it may deteriorate the accuracy of the measurement. The European Noise Directive requires that assessment and measurement shall be planned and carried out by competent services. With ISO 9612 an international standard is available on an engineering method for measurement of worker’s exposure to noise in a working environment and calculating the noise exposure level. The Noise Directive requires assessments to be carried out at suitable intervals. This may be up to national law and practice; but minimum criteria could be given here: When there are significant changes in machinery or production processes that may result in increased noise levels, re-monitoring is recommended to determine whether additional employees need to be included to measures, which are required, when exceeding the lower or the upper action level. In addition a regular re-monitoring - for example once a year - may be recommended. Concerning the data obtained the European Directive requires that the data from the assessment and/or measurement of the level of exposure to noise shall be preserved in a suitable form so as to permit consultation at a later stage.